Have you ever been curious about using social media to launch a giveaway for your medical practice? We’ve helped several clients use social media sweepstakes to drive new patients to their practices, and we’re excited to share a campaign with you that we created and executed for Cataract & LASIK Center of Utah. Cataract & LASIK Center of Utah is located in Orem, UT, a small-to mid-size competitive refractive market. They had never hosted an online sweepstakes to giveaway LASIK, but wanted to grow their patient-base, raise brand awareness and increasing LASIK consult. As a solution, we created the Gift of Vision sweepstakes campaign. The goals: To get 75 LASIK consult appointments and increase fans on the Cataract & LASIK Center of Utah Facebook page by 15%. The messaging: Since the campaign launched shortly after the New Year, our messaging focused on giving yourself the Gift of Vision and starting off 2016 with clear vision and more freedom to enjoy the outdoors in Utah. Experience the New Year with the Gift of Vision. Enjoy seeing the world in 2016 with new eyes. Enter the CLCU Gift of Vision Free LASIK drawing. One special person will experience the joy of improved vision, so you can do the things you love most with reduced dependence on glasses and contacts. Hit the slopes this year and see the spectacular sights of Utah. Since we wanted to increase Facebook page likes, we incorporated “liking” the page into the sweepstakes entrance rules. These were spelled out on a special landing page that we helped Cataract & LASIK Center of Utah create on its website. Rules: To Enter, you must go to Facebook page and like the page; Click on sweepstakes and go to landing page on website for sweepstakes details and rules to enter; complete the form online; attend a free consult to determine if you are a good candidate for LASIK. Sweepstakes goes for one month. Random drawing for a winner. All entries receive $500 off per eye and the chance to win free LASIK. We ran this campaign entirely through Facebook ads and promoted posts, Google AdWords display ads and Pandora radio ads with accompanying display ads. We also used email marketing to an existing Cataract & LASIK Center of Utah database. Pandora, Facebook and Google provided highly targeted demographics for our market, and we used URL tracking and Google Analytics goals to closely watch the conversions and effectiveness of each medium. Because of weekly reporting and monitoring, we learned that Google ads weren’t performing as well as Facebook, so we shifted our Google budget into Facebook and to generate more leads from Facebook. We also learned that Pandora had the highest conversion rate, but at a much higher cost per lead. All marketing efforts were directed and hyperlinked to a custom landing page that was created on Cataract & LASIK Center of Utah’s website specifically for entering the sweepstakes. 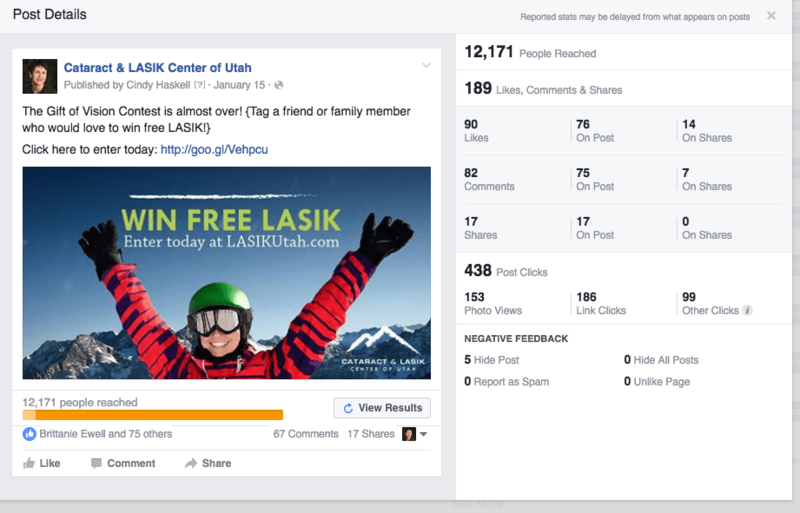 Key elements on the page included imagery to match the campaign advertising, an entry form, a link to Cataract & LASIK Center of Utah’s Facebook page and sweepstakes rules. As the sweepstakes neared its end, we utilized Cataract & LASIK Center of Utah’s Facebook page with posts to create a sense of urgency and encourage fans to share the opportunity with their friends. As a result, we were able to amplify the message across a much larger portion of our target audience. The campaign ads had high click-through rates. Potential patients were motivated to learn more, demonstrating a strong level of interest in LASIK. As expected, some people who clicked the ads didn’t sign up for the sweepstakes. This is okay and even welcomed, as it causes “self-selection” for those who truly want LASIK and are ready to move forward to enter. In fact, this narrowing down of candidates to those who are ready helps Cataract & LASIK Center of Utah’s marketing, as it reduces the number of people who are getting a message that they don’t want or aren’t ready to hear. In other words, the people who entered were very interested in LASIK and many converted into consultations. In summary, for a relatively low cost of $5,500 Cataract & LASIK Center of Utah was able to welcome 100 new people through its doors, giving each person a first-hand experience of their world-class care and expertise. They also performed eight LASIK procedures and grew their potential customer database. 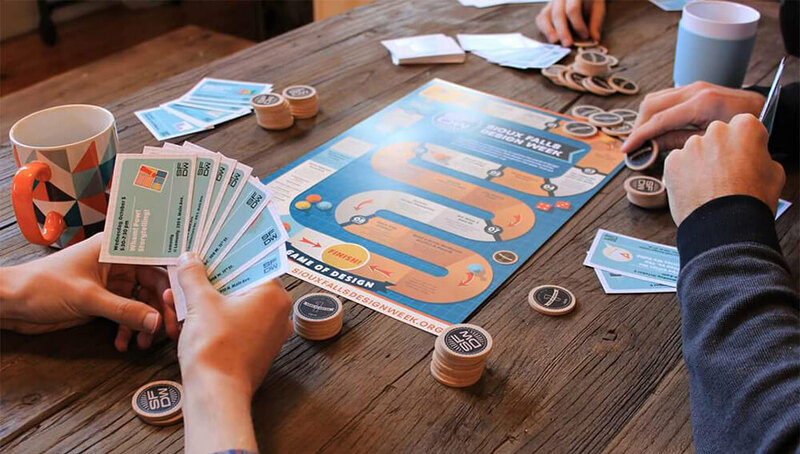 The campaign was fun to execute and generated a lot of positive word of mouth, which will help to create a future patients and brand awareness.